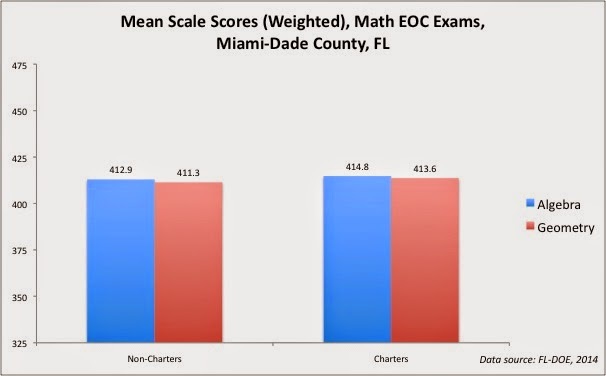 Picking up where I last left off, let's take a look at some test score results from Miami-Dade, FL and see if the charter schools there -- which are, according to the local press, running wild while making their operators boatloads of money -- are really living up to their hype. For this post, we'll keep it simple (for now): let's leave aside the glaring differences in student populations between the charters and the M-DCPS. The FCAT is Florida's state-wide standardized test, given in grades 3 through 10. 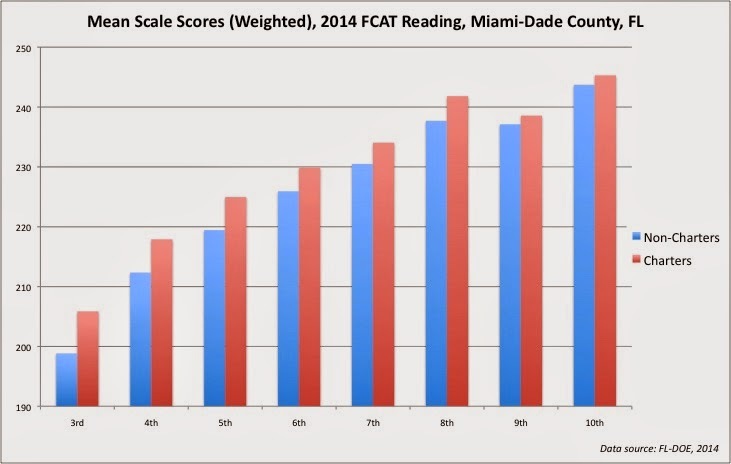 What I've done here is calculate the weighted mean, or average, score for either charters or non-charters as a group across Miami-Dade. 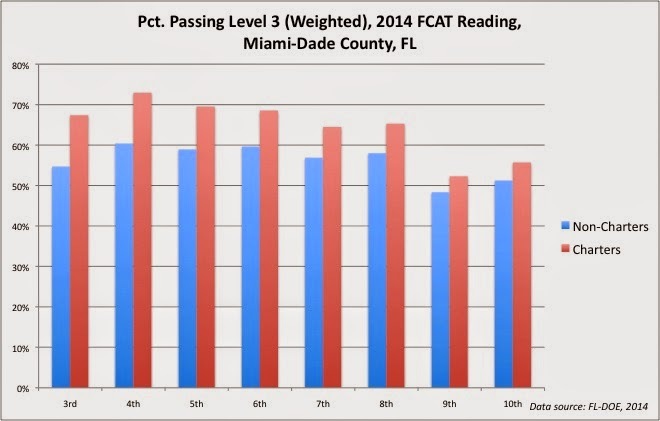 The FCAT uses a "developmental scale score," which allows for comparisons of scores over time; in other words, we would expect the scores to rise from grade to grade. Notice how the non-charters keep pace with the charters through the progression from Grade 3 to Grade 10, even though the non-charters started behind. 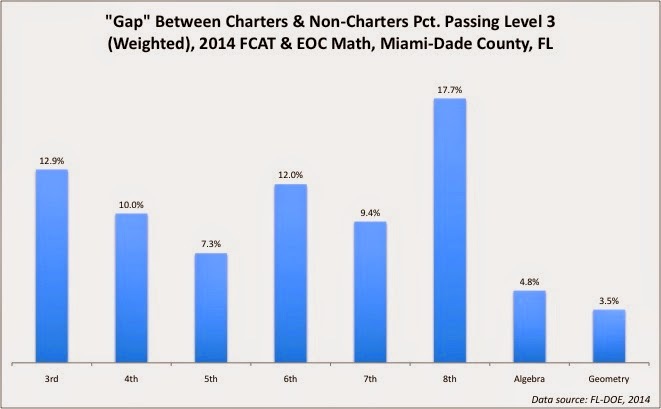 I find this quite telling: if the Miami-Dade charter sector, as a whole, was giving better instruction, why wouldn't the gap between the charters and non-charters increase with each passing grade? This is a different way to measure test-based outcomes: the percentage of students who "clear the bar," or score above a cutoff point that shows proficiency (in Florida, that's "Level 3"). Again, there's no doubt: the charters do have more kids who clear the bar (remember, however: they don't serve the same types of students). What starts as a 13-point gap in proficiency in Grade 3 shrinks to a 4-and-a-half-point gap by Grade 10. Notice that the gap shrinks considerably in high school: do dropouts contribute to this collapse? We know that the charters don't serve as many students, proportionately, who are in economic disadvantage, are Limited English Proficient, or have special needs. At the earliest testing grades, the charters enjoy their widest gap in student achievement with the public schools: very likely, this is due to the fact that they don't serve the same types of kids. As the years progress, the public school students show comparable growth in test based measures to the charters. And the gap between charters and publics shrinks considerably as the students age. Is this "impressive"? I suppose that's a matter of opinion; let's take a look at math before I give mine. Again, non-charter students start behind, but they move up in parallel with their charter peers. 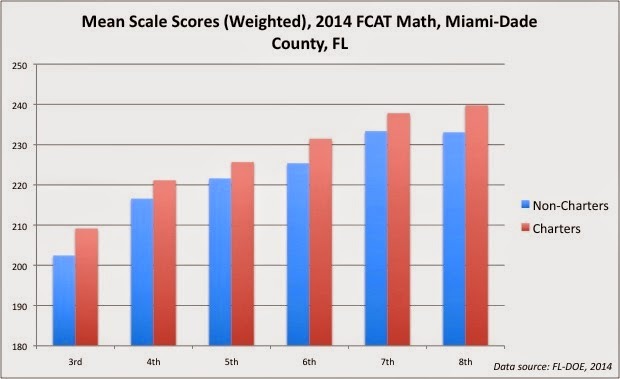 In 8th Grade, the FCAT scores go down, but that's likely because 8th Grade algebra students, who are going to be the better math students, are taking the End Of Course (EOC) exam for Algebra, and not the FCAT (I've looked for confirmation of this, but haven't found it yet). On tests that are on a scale from 325 to 475, the difference between the average charter and non-charter student in Miami-Dade in high school math is less than 2 points. 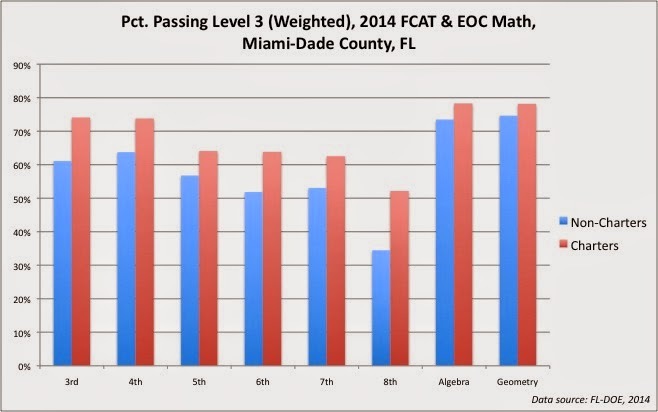 Again: what's likely happening in Grade 8 is that the more mathematically advanced students are not taking the FCAT, but instead the EOC Algebra test (of course, that's also true for the charters). We have a much less smooth decline in the gap here compared to the reading proficiency rates. The high school courses, however, tell much of the story: the charter "advantage" in high school math is, for all intents and purposes, non-existent. Hundreds of millions of taxpayer dollars diverted to private company profits, instead of being put into the classroom. A charter sector that educates far fewer students with special needs or who live in economic disadvantage, leaving the public schools to pay for students who are more difficult and more expensive to educate. The abrogation of the rights of families who send their children to charters. A few extra scale score points on tests -- but no evidence of sustained differences in student achievement over time compared to the public schools. Me? I'm just not seeing it. Even if you want to get small test score gains by segregating your student populations -- a dubious proposition to begin with -- why give millions of dollars to charter operators? The small gains just don't seem to be worth the big costs. Maimi charter school edu-preneur and Academica business partner Pitbull. 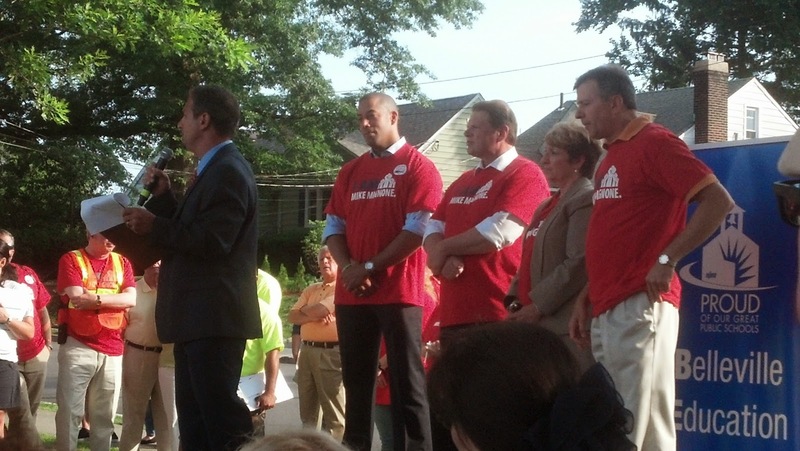 [NJ State Senator Mike] Doherty [R- Tea Party] also brought up what he said was another broken promise from Christie. He said the governor had promised to make equal school funding a key theme of the 2013 campaign, in which all 120 seats in the Legislature were up for grabs. He expanded on that when I spoke to him Friday. Doherty has been crying about the "unfairness" of giving more state aid to districts with more at-risk students for years. He makes unsubstantiated charges of fraud in the classification of students as being "at-risk." He ignores the vast amount of evidence that money does, indeed, matter when it comes to educating children in economic disadvantage. His hypocrisy in demanding more for his own suburban district while leaving urban districts, full of student sof color, to hang is simply stunning. But even Doherty hasn't, so far as I know, admitted until now what his jihad against education funding adequacy is really all about: naked political posturing. I guess there's one good thing about gerrymandering districts: "safe" politicians like Mike Doherty can feel free to say what's really on their minds every once in a while. And what's on New Jersey's Worst Senator's™ mind? Clearly, it's not the education of kids in poverty. UPDATE: I really try hard to get this stuff exactly right; in this case, I made a small mistake, and I'm replacing the graphs. Honestly, you would hardly notice the difference if I put the graphs side-by-side, but I try to set the bar pretty high here, and I don't want stuff out there that isn't completely bulletproof. While I was at it, I decided to add the numbers for another charter management organization, CharterUSA. Like the others, I tagged their schools by looking at the website. The series from the SunSentinel on Florida's charter schools is well worth the read: it's the Wild West down there, with some of the craziest stories of charter school malfeasance, corruption, and incompetence you could imagine. What's missing, however, is some hard data on student population characteristics and academic results. I want to try to fill that in over the next few posts. 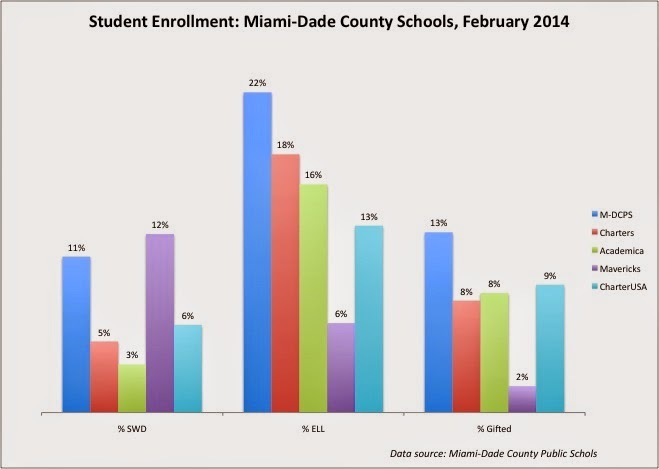 Data here is from two sources: the FLDOE and the Miami-Dade County Public Schools. The following two graphs come from M-DCPS data. 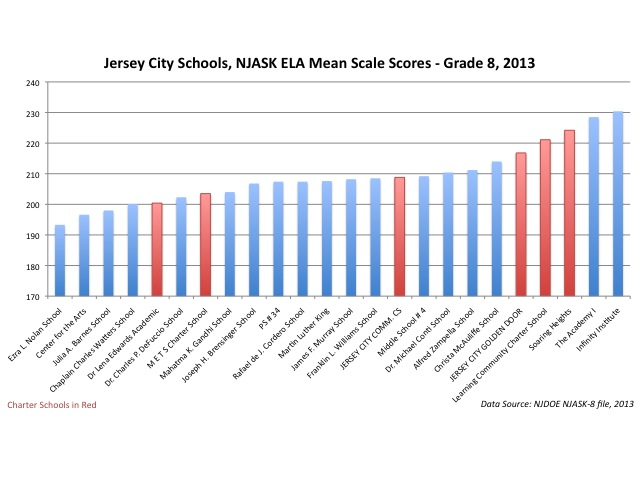 The blue bars represent the M-DCPS -- the non-charters. Red bars are the charters; green and purple are two of the better-known for-profit charter school operators, Academica and Mavericks. Academica, as I reported last year, has an amazing scheme working for them: using taxpayer-subsidized financing, they build new charters on land that they control, raking in lease payments from charters they, in many cases, operate. The Tampa Bay Times reported last April that the company is under federal investigation. Biden, the brother of Vice President Joe Biden, offered some red meat, saying the school choice movement needs to continue organizing parents – and accumulating political power. 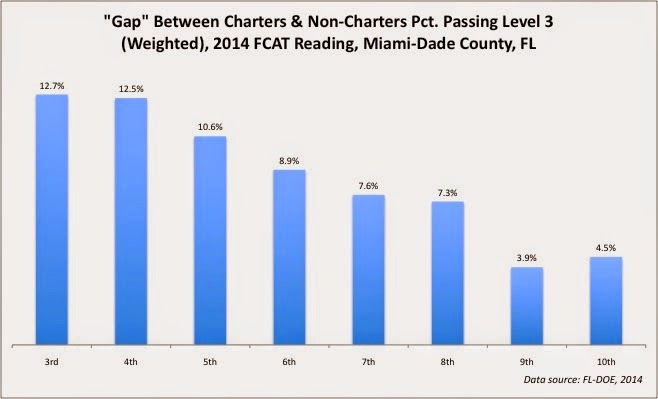 What's clear here is that these charter operators are not serving a representative student population of the Miami-Dade School District. Academica is, for all intents and purposes, a Hispanic school system, enrolling fewer Free and Reduced-Price Lunch (FRPL)* students than M-DCPS. Mavericks has a black student population strikingly larger than the rest of the area, and far more boys, even as their FRPL population is relatively smaller. The charter sector, and Academica in particular, has left the education of Students With Disabilities (SWDs) to M-DCPS. Mavericks is the big exception here, but remember: not all "disabilities" are the same. I haven't yet found whether the data is there to explore this further. I also find it striking that Academica has such a large Hispanic student population, yet a smaller proportion of English Language Learners (ELL) than M-DCPS (reminds me of the Noble charter chain in Chicago). It's going to take a bit of time to get a handle of how this affects student achievement. But it's worth repeating: any time you hear that Florida's charter schools are getting "great" results, remember that they do not serve the same student populations as the local public schools. I often get the feeling some folks would rather you not remember this. Charter school edu-preneur and Academica business partner Pitbull. * Annoying: both FLDOE and M-DCPS data do not disaggregate free lunch from reduced-price lunch students. Yes, it matters. After telling Jersey City parents two weeks ago that the school district was investigating a possible data breach of personal student information, and then saying two days later that there was no data breach, school officials now allege that a local charter school did indeed improperly access the personal information. In a letter sent to parents on Friday, School Superintendent Marcia V. Lyles said a district investigation has concluded that M.E.T.S. Charter School officials have admitted they "accessed" the district's computer system to obtain personal information on district students. The district subsequently restricted the charter school's access to the system and is meeting with its software vendor to determine the extent of the data breach and how to protect student information, according to the letter. "The district will continue to work to ensure that our student information is secure," Lyles said in the letter, adding that the district has alerted the state Department of Education about the matter. Board of Education member Ellen Simon, speaking on behalf of the nine-member board, said the data breach was done "without district knowledge or consent." A Jersey City charter school accused of improperly accessing the personal information of district students is denying the claim in a statement sent to The Jersey Journal tonight, with charter school officials saying the district allowed the school to access the data. "The M.E.T.S. Charter school was an authorized user of the district's computer system," reads the statement, the school's first regarding the alleged data breach. "There was no breach." On Friday, the Jersey City school district sent a letter to parents saying that M.E.T.S. Charter School, located on Sherman Avenue, improperly accessed personal student data. The district began investigating the matter after parents said M.E.T.S. mailed home registration information in the students' names. "The address information used was marketing information that is widely available to the general public through paid and free service companies," the M.E.T.S. statement reads. Parents told The Jersey Journal that at a June 11 meeting, Schools Superintendent Marcia V. Lyles said M.E.T.S. obtained information that included students' names, addresses, phone numbers and possibly social security numbers. "Marketing information," huh? Well I guess we know what's being marketed; according to the Jersey Journal: "The district began investigating the matter after parents said M.E.T.S. mailed home registration information in the students' names." Whether or not the charter obtained the information with consent, it's clear they wanted the data so they could sell themselves to the families of the district. Perhaps the largest controversy surrounding the charter school sector is whether or not charters "skim the cream": whether they deliberately screen out students who suffer from economic disadvantage (as measured by free-lunch (FL) eligibility), or Limited English proficient (LEP), or have special education needs (SpecEd). - First, it's easy to ward off families with special needs students: just don't provide the services their children need. Don't offer an extensive bilingual program, and you won't get many LEP applicants. Don't offer an ABA program with opportunities for mainstreaming, and you won't get many autistic applicants. "Suggest" that parents should be prepared to donate a specific amount of time to assist in school, and you won't get many FL applicants. It's really that simple. - Second, the "relinquishers" often underplay the amount of social capital necessary to navigate a "choice" system of education. Immigrant families and the working poor are far less likely to be as sophisticated in making "choices" than those who are in a higher socio-economic status group. 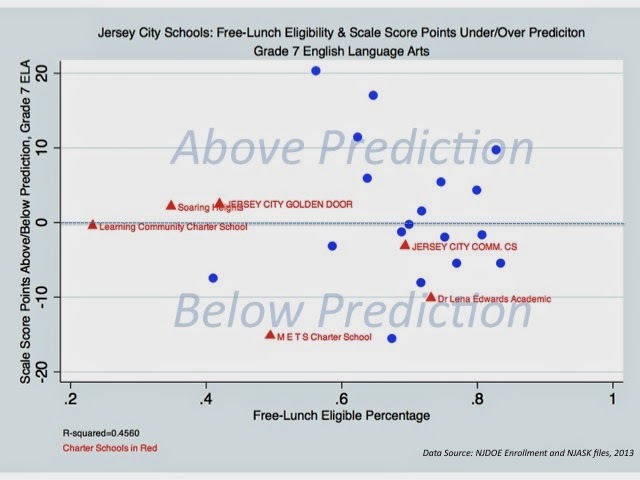 Whether you buy into this or not, it's clear that something is causing the charters in places like Jersey City to wind up with substantially different student populations than the local public schools. M.E.T.S. enrolls grades 6 to 12, so I'm limiting this sample to schools that enroll 8th Graders; I have some graphs that show high school comparisons below. 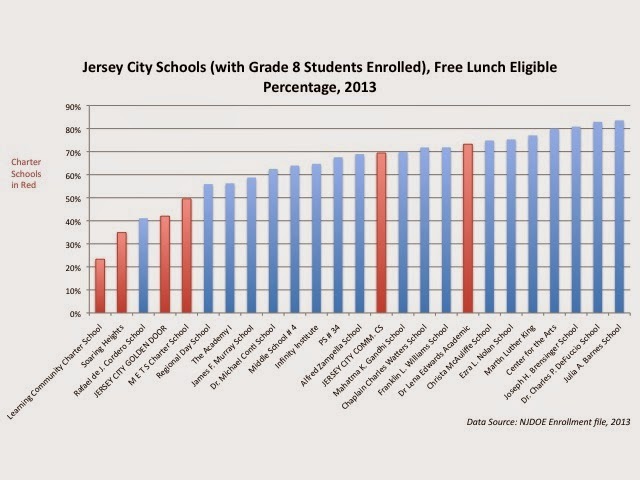 Four of the five "middle" schools in Jersey City that serve the lowest proportions of free lunch-eligible students are charter schools. Can this possibly be an accident? Especially when considering the enrollment of LEP students? 100% of Regional Day's students are SpecEd so it's obviously an anomaly. M.E.T.S. 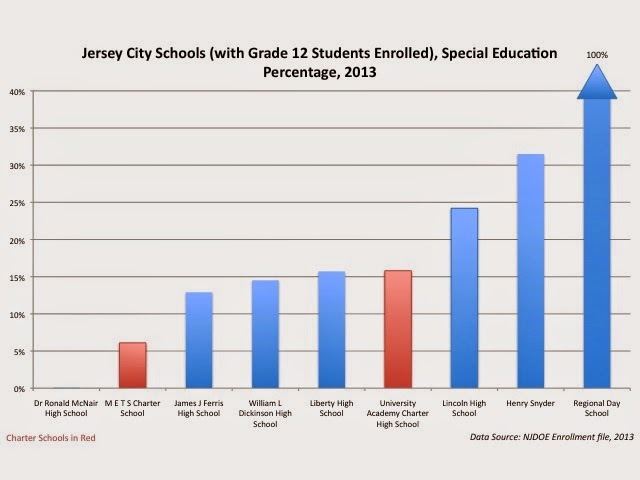 Charter School has a special education rate lower than even The Academy I, Jersey City's designated "gifted and talented" school. Again: I'm not saying M.E.T.S is engaging in cream-skimming on purpose; I'm saying that a "choice" system is inevitably going to create segregated schools like M.E.T.S., deliberately or not. I am always loathe to point out the relative deficiencies on test scores for any school, charter or public: there's a lot more to a "good" school than test scores. But if we're going to use data to tar-and-feather public schools, let's use it fairly on charters. The truth is M.E.T.S., despite its low FL, LEP, and SpecEd percentages, isn't all that impressive. "But wait!" say the charteristas. "Look on the right side of the graph! Those charters are spectacular! All we have to do is make more of them!" Well, sure, those average scale scores are great... but we're not accounting for variations in student populations, are we? I mean, it's much easier to get good scores when you have fewer kids, proportionately, who are FL, LEP, and SpecEd, right? So let's account for that. 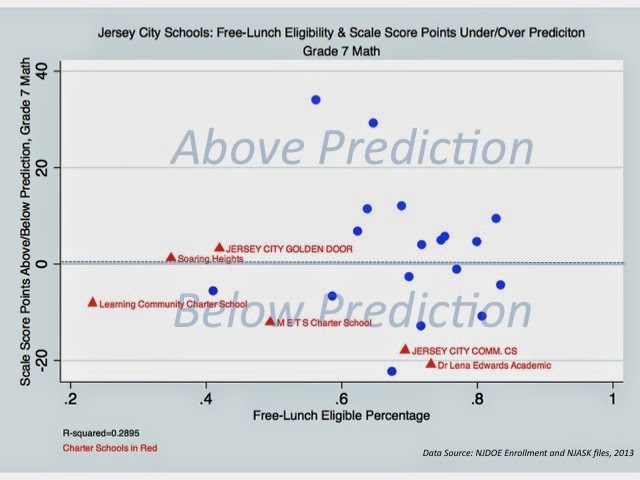 We'll run a basic regression model that accounts for these three factors -- free lunch eligibility percentage, Limited English Proficiency percentage, and special education percentage -- and come up with a prediction for each school based on that model. We'll then see whether each school comes in above or below prediction, and by how much (geeks, the regression output is below). 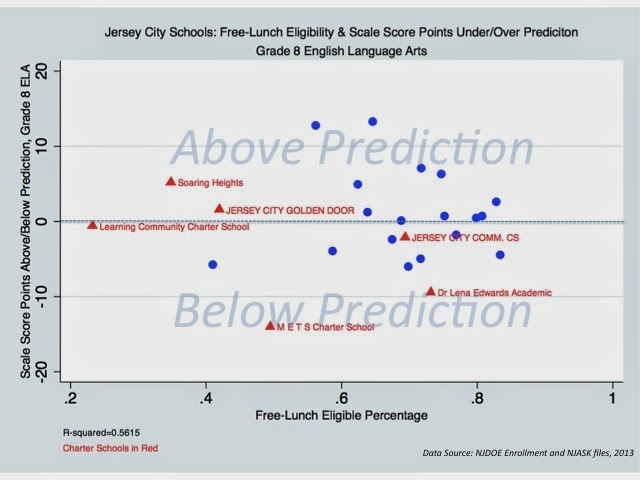 The first thing to notice is that, as Bruce Baker pointed out in his post, there are two different types of charters in JC. Look along the x-axis: it's the same data as the bar graph above. 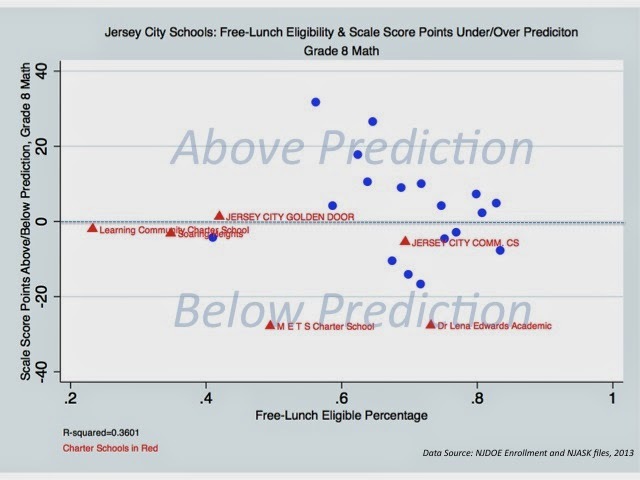 Lena Edwards and Jersey City Community charters are much more similar to the JCPS schools than the rest of the charters in the city in the number of kids they enroll who qualify for FL . But, again, what advantage did that give those segregated charters? Well, M.E.T.S. is way below where we'd expect them to be, given their student population; in this model (which is very limited and only gives us a clue about any school's "efficiency"), M.E.T.S. is one of the lowest-performing schools in the city. 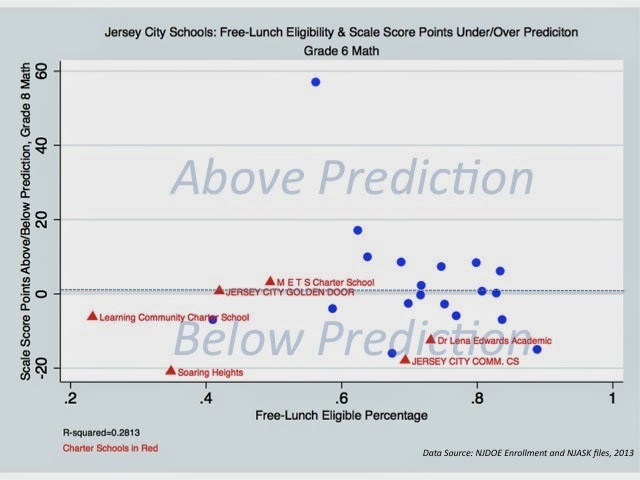 But it's not like the rest of Jersey City's charter sector is doing much better. There are plenty of JCPS schools that do just as well, if not better, within this model -- and they are serving far more children in economic disadvantage. 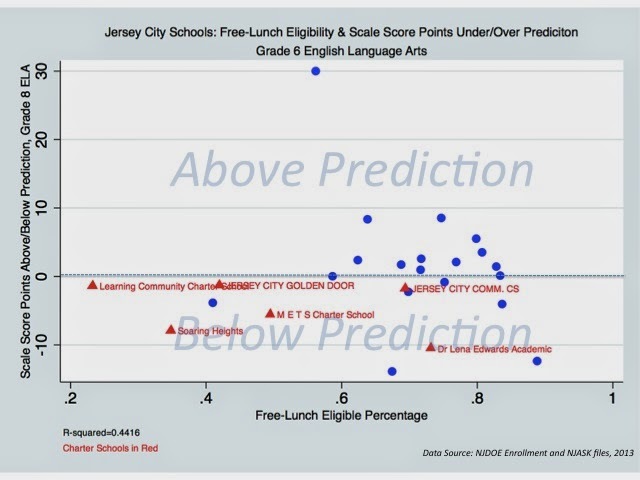 If the Jersey City charters were all that, we'd be seeing more of them above the prediction line. As it is, they perform from about where we'd expect to substantially below. 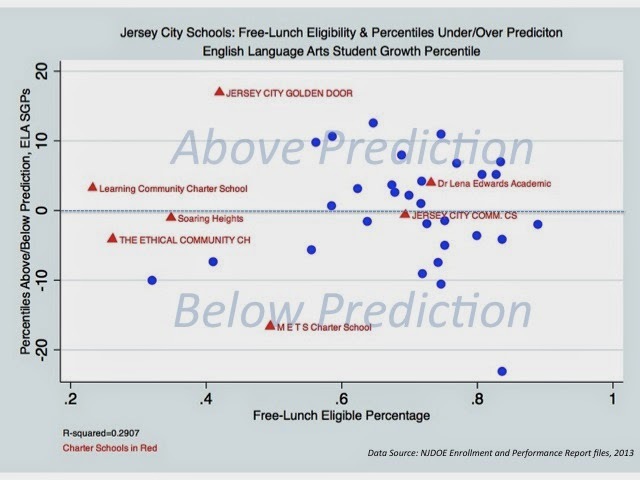 I'll give props to Jersey City Golden Door on this last graph: they do substantially beat prediction on ELA SGPs. Taken together, however, the Jersey City charter sector is quite underwhelming. 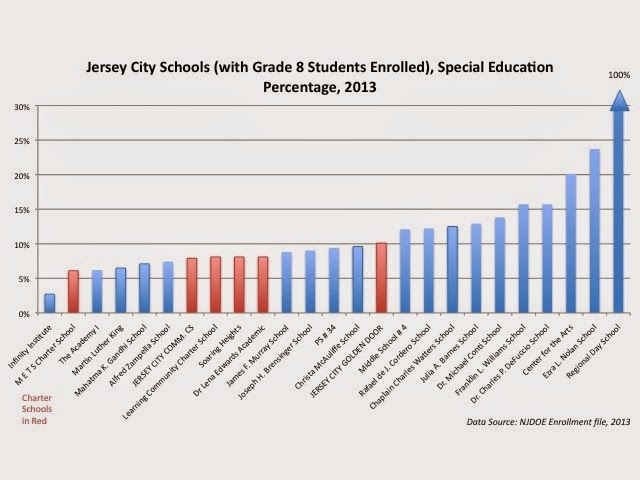 While some of Jersey City's charters come close to matching the student populations of JCPS schools, the sector, as a whole, is not educating its fair share of children in economic disadvantage, who have limited proficiency in English, or who have special education needs. 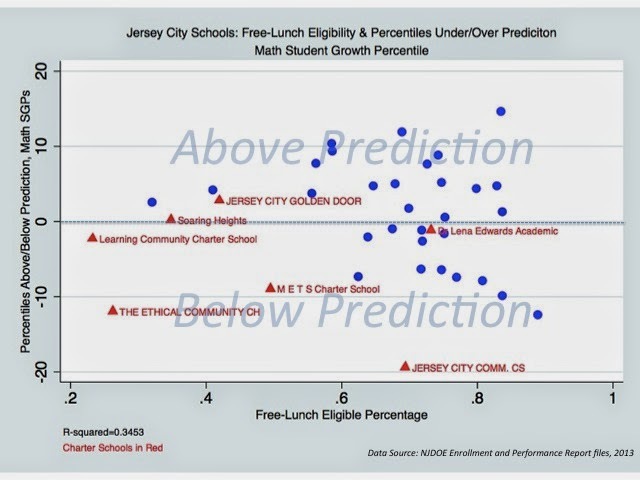 When accounting for their differing student populations, Jersey City's charters are not getting particularly impressive test-based results, either in absolute scores or in measures of growth. Yet here is M.E.T.S., advertising itself to the families of Jersey City in mailers, attempting to lure them away from the public schools which, as a whole, take more children who have special needs and who, in many cases, do a better job than the charters. But if M.E.T.S. 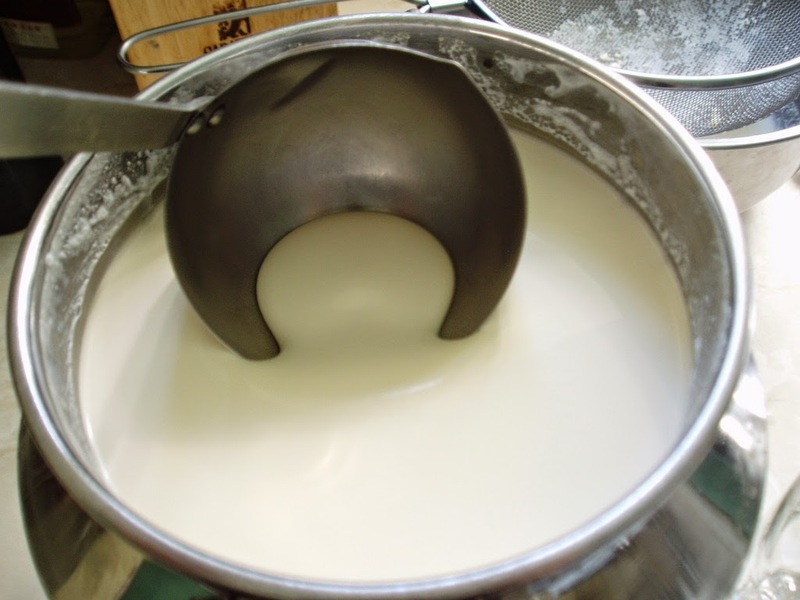 can't get better results even after skimming the cream (unintentionally or otherwise), what's the point? Why allow charters to recruit when they aren't doing any better than the local public schools? 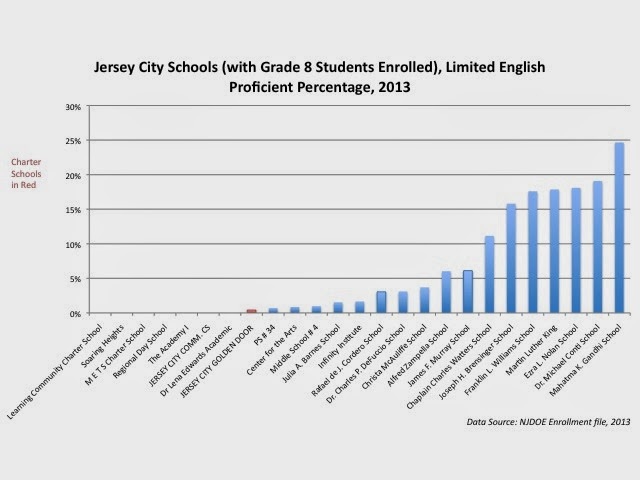 ADDING: Here are some demographics for the high school population of Jersey City. If a school enrolls Grade 12 students, it's on these charts. Give University Academy Charter their props: their student populations look much more like the rest of the city than M.E.T.S. 's does. * Bruce is my advisor at Rutgers GSE in the PhD program. There's a new poll, just out yesterday, that details the thoughts of California's citizens when it comes to education and tenure (the text is here). The biggest conclusion? Yes, one-third of Californians said there shouldn't be any tenure -- right after two-thirds of Californians said there shouldn't be any tenure. - Nobody wants bad teachers in the classroom. But nobody wants to see someone get fired arbitrarily. - Nobody thinks a bad teacher should get to keep her job while a good teacher is laid off. But nobody wants to see layoff decisions made that are functionally the same as rolling dice. - Everyone thinks people who do a good job should be rewarded. 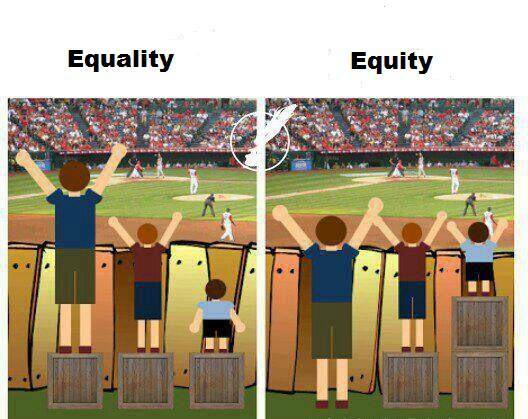 But nobody thinks it's fair to reward only a scant few who happen to get lucky. - Nobody thinks schools that serve poor kids should be staffed by inferior teachers. But it doesn't make a lot of sense to fire staff if you don't have good replacements -- and how do you get those without making working conditions better and raising pay? - Nobody thinks anybody should have a "job for life." 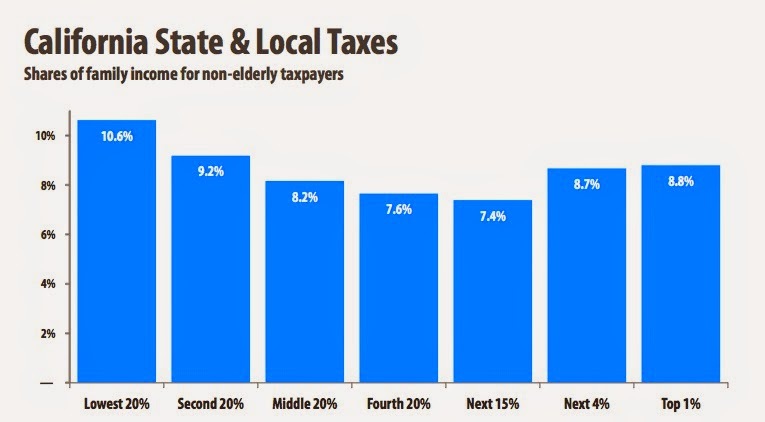 But I don't see many folks clamoring to pay more in taxes (especially in California), and tenure has a value to teachers but costs taxpayers nothing; who would want to get rid of something that's such a good deal for them? 25. Do you think California public schools currently have the money needed to provide students with a quality education, or do you think the state should be spending more on schools? Two-thirds of Californians don't think the state spends enough to educate its children. Maybe David Welch can fund a lawsuit to do something about that. Of course, that would mean that he would have to pay more in taxes. Heaven forbid, he might actually have to pay as much as poor Californians do! Now this is something I'd like to see a poll about; wouldn't you? My post about Mike Mignone, the brave teacher and union leader in Belleville, NJ who is up on tenure charges, went viral this week. Mignone has been on unpaid leave pending his hearing; he alleges it's because he asked dared to question his school board about an outrageous surveillance system that includes a camera and microphone in every teachers lounge. That system cost $2 million, money teachers and parents told me is desperately needed to buy modern textbooks and computers. It's also worth noting the firm that got the contract to install the system hired the brother of the board attorney and the son of one of the board members. Golly, what are the odds? We'll have to see how this all plays out, but the charges against Mignone stink of retribution. Had he not had tenure, he would have been fired on the spot, quite possibly becoming toxic enough that he would have to leave the profession altogether. This is the side of tenure publicity hounds like Campbell Brown don't want to talk about: tenure isn't just teacher protection, it's taxpayer protection. Brown would have us believe that there are scads of "bad" teachers everywhere. What she and her ilk never seem to acknowledge, however, is that there are plenty of districts, like Belleville, where tenure is perhaps the only thing that is keeping the entire system from sliding into chaos and corruption. Here's another example: Elizabeth, NJ. ELIZABETH - Is the woman who blew the whistle on the Elizabeth school lunch scandal facing retaliation for speaking out? A Kane In Your Corner investigation finds her position has been eliminated and she's been forced to spend her last weeks on the job alone in a small windowless office. "They placed me in a room, completely isolated, by myself," Carmen Southwood tells News 12 New Jersey's Walt Kane. "Bare walls, no phone, nothing." If the accommodations are unimpressive, Southwood says the assignment is even worse. She says she is literally being paid to do nothing, and no one interacts with her. It started a couple of weeks ago, when Southward was told her contract as a food services supervisor would not be renewed at the end of the school year. She says other employees she knows of in that situation were permitted to continue working for the duration of their terms or were sent home with pay, and only she was banished to a "rubber room." "To do that to someone is really to try to play psychological games with their minds and to try to break them," Southwood says. She is convinced "without a doubt" that she is the victim of retaliation. According to a 2011 investigation by the Star-Ledger, this is quite typical for Elizabeth's schools. Testimonial dinners are held to honor the superintendent and president of the board of education — not to raise money for scholarships or education, but to funnel more into campaign coffers. Can you imagine how much more out of control this would be if teachers didn't at least have the protections of tenure and seniority? Carmen Southwood can. All of you reformy types who are so hellbent on gutting tenure have been getting away with weak arguments for your position. Vergara has changed that; the conversation is now shifting over to what an actual tenure-free world looks like. It's time to start answering some hard questions. How will you tenure bashers assure taxpayers that districts without tenure won't turn into nests of corruption and nepotism? Careful! 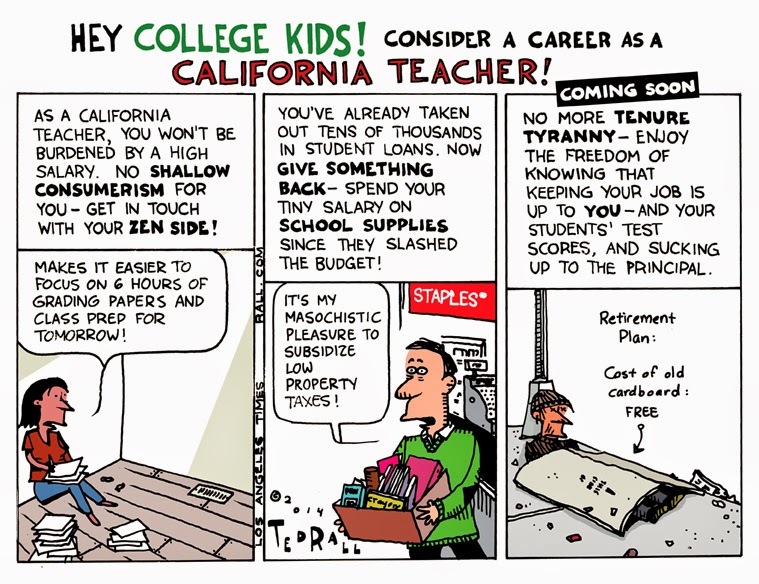 Cartoons like this can get you fired: ask Ted Rall. In the wake of the truly awful Vergara decision, there have been plenty of reformy types crowing that we just don't need teacher tenure any more. "There are more than enough protections for teachers against vindictive administrators and school boards!" they claim. "Tenure just isn't necessary!" These people need to take a trip up the Garden State Parkway and visit Belleville, NJ -- home of the most egregious example of why teachers need tenure I've ever witnessed. BEA President Mike Mignone, with NJEA officers Sean Spiller, Wendell Steinhauer, and Marie Blistan. 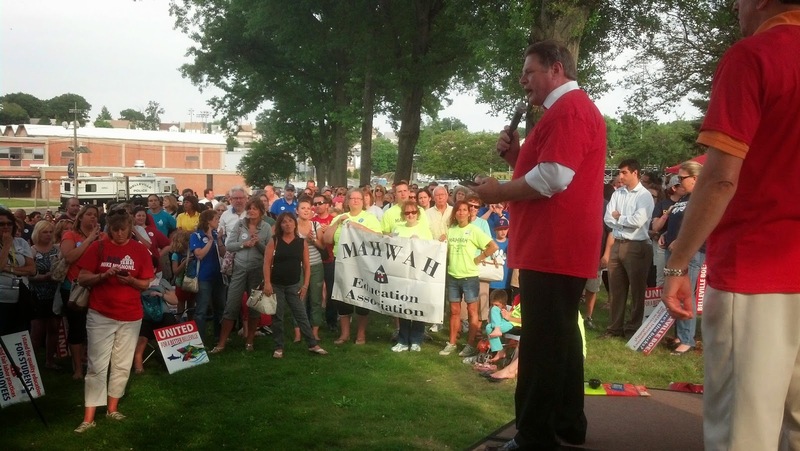 This evening, I'd estimate easily a thousand people gathered on the grounds outside Belleville High School to rally to the aid of the president of the Belleville Education Association (the local teachers union), Mike Mignone. Included in the crowd were the entire NJEA leadership, including current president Wendell Steinhauer and former president Barbara Keshishian; teachers union leaders from 12 different counties; teachers union leaders from Newark's NTU; the president of the Belleville Fireman's Association and many of his members, truly Belleville's Bravest; hundreds of teachers from literally all over the state; and concerned parents and students from Belleville, a town that is seeing its dedicated teachers pay the price for its school board's and its superintendent's incompetence. Of course, they weren't there only for Mignone; they were there because his case threatens both Belleville's schools and the future of the teaching profession in New Jersey. They were there because his case demonstrates clearly why America desperately needs to reinvigorate its labor movement. They were there to show unity in the face of ineptitude and intimidation. They were there because, ultimately, they have all had enough. It's going to take a series of posts to tell the entire tale of how Mike Mignon has become New Jersey's poster boy for tenure: the story is so twisted and so disgraceful a single piece can't possibly do it justice. But let's start by giving you the basics, which I will flesh out over the next few days. To put it charitably, Belleville's schools have been very poorly managed. The district's budget is so bad that the state appointed a fiscal monitor this year to try to restore some financial sanity. Teachers and parents both told me that the schools lack contemporary textbooks, modern computers, and even the infrastructure necessary to administer the Common Core-aligned PARCC tests mandated by the state for next year. Perhaps the worst decision the district made over the last few years was to install a state-of-the-art surveillance system in all of its buildings; yes, a "surveillance" system, not a security system. Every classroom in every building is wired for both video and sound -- including the teachers lounges! That's right, my fellow teachers: in Belleville, a camera and microphone monitor every word uttered in the teachers break room! But that's not all: all Belleville faculty, high school students, and middle school students must have special ID cards with them at all times. These ID's include "RF-tags," which are radio frequency devices similar to what you'd find in an EZ-Pass. They were originally used to track cattle: now, they track the positions of all staff and all students at all times. I asked several parents at the rally whether they were ever asked for their permission to require their children to have an RF-tag on them at all times; every one told me they were never asked. The teachers, it goes without saying, find the entire system insulting and degrading, to both themselves and their students. 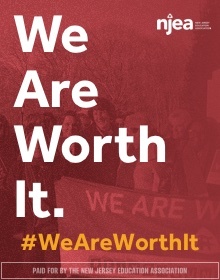 According to a union survey, more than half of the members of the BEA feel intimidated in the workplace, and three-quarters felt their participation in union activities would result in negative consequences. Regular readers of this blog will not be surprised when I tell them about the resume of Belleville's superintendent, Helene Feldman: she cut her teeth -- surprise! -- at the NYCDOE, under reformy Joel Klein and reformy Chris Cerf (and those are a couple of guys who really know how to get teachers and parents on their side...). NYC is, of course, the training ground for the increasingly unpopular Paymon Rouhanifard in Camden and the spectacularly unpopular Cami Anderson in Newark. Only a superintendent who served under Klein and Cerf would ever think teachers would take kindly to having their classrooms and lunch breaks and bathroom trips monitored. The real kicker here, however, was the price: $2 million dollars. Just tonight, the state-appointed accountant who looked at Belleville's budget told the crowd at the board meeting that the district was $3.6 million in the red for next year -- and that's after having used up all of its budget surplus. How in the world does the Belleville BOE justify spending all that money on this obnoxious surveillance system when they can't even afford textbooks and computers for the schools? When the system was booted up this past fall, the teachers union decided they'd had enough. It was bad enough the board wasted this money on invasive technology that wouldn't do anything to stop a Sandy Hook-like attacker. It was bad enough that teachers were now being watched constantly, as if they worked in a Soviet reeducation camp. But all of this had been implemented without the benefit of any negotiation, a clear violation of the collective bargaining rights of the BEA. Mike Mignone, as president of the union, started speaking out. A 13-year veteran math teacher with a spotless record, beloved by his students and fellow teachers, Mignone wasn't going to just sit by and watch his members continue to be harassed and intimidated. He demanded that the board and the superintendent explain themselves: where did they get the funds for the surveillance system? Why was the time between the advertisement of the bid and the final decision less than two weeks? Why did the entire bidding process stink of nepotism? Mignone was making things very uncomfortable for the board and the superintendent by speaking out. He was putting a lot of people in difficult positions by calling for transparency and demanding that taxpayers get clear answers about how their money was being spent. As Mignone's lawyer puts it: in October, he found out; in November, he spoke out; in December, tenure charges were filed against him. Mignone, who had always had excellent reviews, suddenly found out he would be up on charges that included (get ready for this one) answering students' questions about the surveillance system. According to Mignone, his students asked him questions about whether they were being monitored; he took a few minutes out of class and gave them some honest answers. That, in this board's and this superintendent's minds, counts as a fireable offense. If New Jersey didn't have tenure laws, Mike Mignone would have been fired on the spot -- all for the sin of daring to stand up for the taxpayers and teachers of his town. Mignone's case is the perfect illustration of how tenure not only protects teachers, but also taxpayers. NJEA President Wendell Steinhauer addresses the crowd at Belleville High School. Tonight was amazing. Not only was the Belleville community out in full force: there were teachers in their local union shirts from Mahwah, Glen Rock, South Brunswick, Summit, Ramsey, Bergenfield, Mercer County Vo-Tech... everywhere around the state. It was an amazing show of support for one man who has been grievously wronged by trying to do right. This is how we fight back. This is how we make them pay for striking at us. This is how we win. 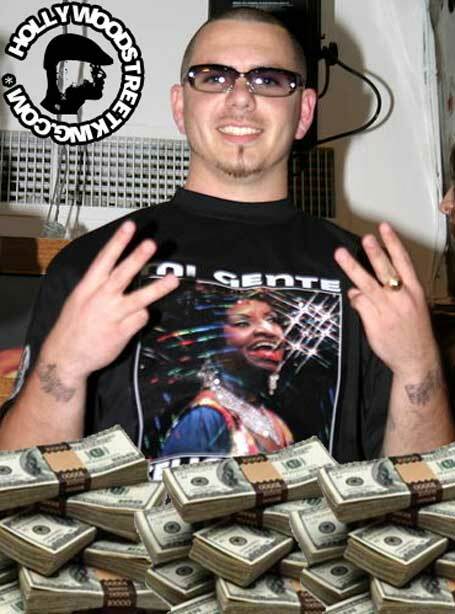 When they go after one of our own, we all have to get together and say: "Enough." When a good man and a good teacher pays a price for speaking out, we must all demand that justice be done. We simply can't afford to stand by idly anymore and let others fight for us. We must have each others' backs -- all of us. Lord knows I can't go to every rally and every union event; no one could. But we all have to start stepping up our game. We have to make the commitment to do whatever we can to help out each other. All hands on deck. Our students and our families deserve no less. As does a hero like Mike Mignone. ADDING: It is so enormously gratifying when you come up to me at these things and tell me you enjoy this blog. So many of you were so generous with your kind words this evening. Many, many thanks. According to U.S. Census Bureau data for 2012, nearly 40 percent of Paterson’s children live in poverty. Unemployment is about 15 percent, nearly double the statewide average. Paterson also has the eighth-highest violent crime rate in the state, just behind Newark. 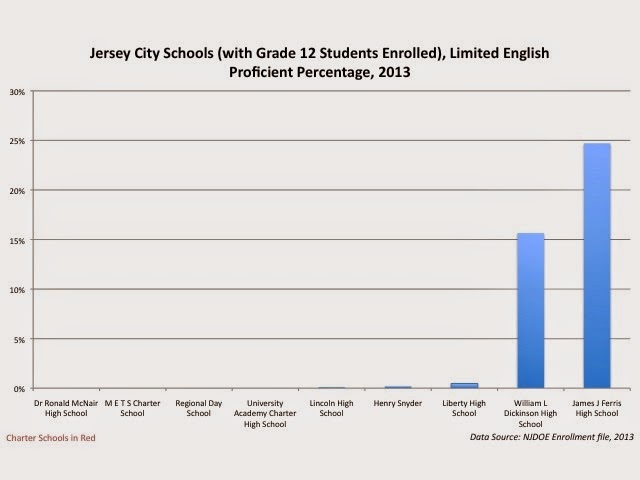 NJ Department of Education data shows that 91 percent of School No. 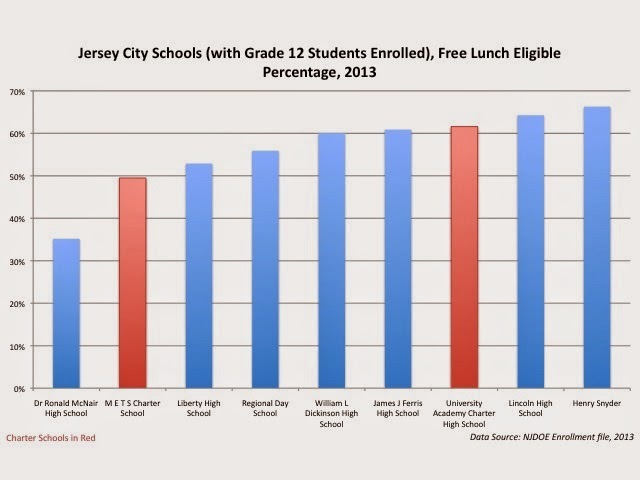 4’s (also known as Napier Academy) students qualify for free or reduced-price lunch; even for Paterson, that’s very high. Over 15 percent of Napier’s students are classified for special education services, and 9 percent are Limited English Proficient. Given all of these disadvantages -- and given the regular intoning from the Christie administration and education “reformers” about the importance of education in combating poverty -- you’d think Paterson would be the recipient of all sorts of state aid to help its education system. But the Silk City’s schools, like all the other former Abbott districts, have taken a hit in these past few years. According to the Education Law Center, Paterson’s schools have been underfunded by over $100 million dollars over the past five years, compared to what they should be getting under the School Funding Reform Act (SFRA). According to ELC, this past year alone the amount of underfunding in Paterson is over $51 million on a budget of about $570 million. That's a gap of about $1,900 per pupil. Which means the district doesn't have the money to address some of its most basic needs. 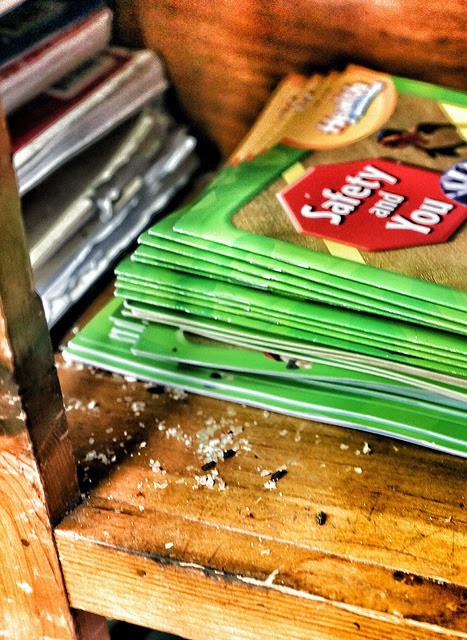 Yes, friends, that is indeed rodent excrement alongside student workbooks. This is one of the photos from the brilliant exhibit “A Blind Eye: The Immorality Of Inaction," which documents the dangerous and disgusting conditions in New Jersey's urban schools. This particular photo comes from Paterson's School No. 20, which has a Free and Reduced-Price Lunch (FRPL) eligibility rate of 85%, a Limited English Proficient (LEP) rate over 7%, and a Special Education (SpecEd) classification rate of 23%. Here's School No. 20's food preparation room. Let's be clear: the people who suffer the most from this illegal neglect are Paterson's beautiful, deserving children. But who else pays the price? 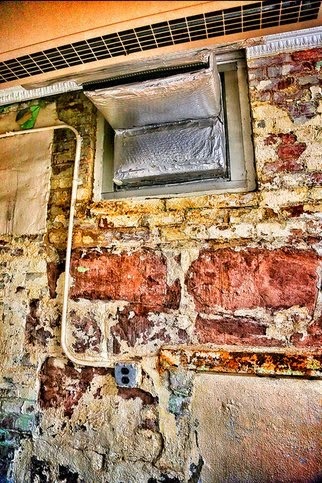 These are the working conditions for Paterson's college-educated professionals. Not only do teachers have to deal with rodents and exposed wiring; they have to wrestle with the chronic poverty and its attendant social ills their students bring through the classroom doors every day. 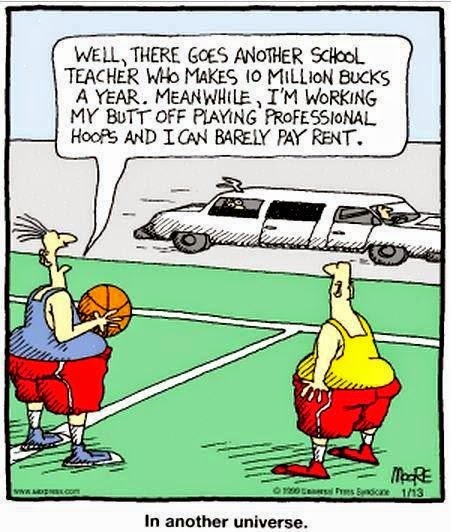 Does it ever occur to these reformy folks that if we really believe teachers are important -- especially in urban schools with many economically disadvantaged students -- we should give them great working conditions and decent, middle-class pay? Paterson remains a state-controlled district, which it has been for over two decades. There have been some noises made in Trenton about returning partial control to the district, but the state still makes all of the important decisions. But this is the same state that allows sickening learning and working environments like those at School No. 20. And it's the same state that allowed Paterson's dedicated teachers, laboring in impossible conditions, to work without a contract for four long years -- that is, until last May, when the state and the teachers union reached a tentative agreement. But keep in mind: the state that brokered the deal continues to underfund the district, and allows the working conditions to remain atrocious. The city’s teachers union has postponed Monday’s ratification vote on a proposed labor contract that has become the target of widespread opposition among members. An email that union leadership sent to members said Paterson Education Association (PEA) members met for more than four hours on Thursday to discuss the proposal. “It became easily evident that the hundreds of people who came out were strongly opposed to the proposed settlement,” said the union email. But guides also change year-to-year. So step 5 this year pays more than step 5 last year, and step 5 next year will pay even more. Also, teachers can move "horizontally" on the guide: more pay for acquiring an advanced degree. When you are working without a contract, the assumption is that you will get "retro" pay: there will be guides put in place for the years you already worked, and you will move retroactively up steps and horizontally if you've earned a degree. Well, someone sent me a copy of the proposal. And as you can imagine, considering the gross underfunding of the district, the news is not good for Paterson's teachers. There is no retro pay for 2010-11, and steps are "frozen" in other years for teachers without advanced degrees. There is some compensation to make up for that, but it's small. The new "universal" guide seriously degrades the value of an advanced degree. They also say the proposal undermines the practice of providing extra money to teachers who obtain advanced academic degrees and that the retroactive pay provided under the deal is less than what union members would have gotten if the old contract had remained in place. The tentative settlement had been reached in May after city teachers had worked almost four years without a new contract. Let me say here what I said consistently about the Newark teachers contract when that was being ratified back in 2012: it is not my place to tell Paterson's teachers to accept or reject this contract. Only the members of the PEA can make that decision, and I would never fault them for going one way or the other. Further: I never have a problem when union leadership brings a deal to its members. Unions are democratic institutions and leaders should take their cues from members. I've never met PEA President Peter Tirri, but I know he's spent years working on behalf of Paterson's teachers. If he thinks this is the best deal he can get, I am more than willing to take his word on that. On the other hand, if the rank-and-file want to stick it out, they should be able to vote to do just that. Debate is one of the great traditions of unionism, and it should be encouraged and allowed to occur in an environment of respect. One of the primary reasons New Jersey has provided more money to school districts with many at-risk students is to attract the best talent possible into the most difficult teaching situations. If, as the reformyists claim, teaching is so important, we need to create working conditions for teachers that will recruit and retain the people we need in the profession. But when you consistently underfund a school district, you all but guarantee that teachers will be underpaid: this is exactly what is happening right now in Paterson. What are the consequences? Some of Paterson's teachers will stay. Teachers, as a rule, tend to be a loyal lot, and often form personal attachments to their districts, their schools, and their students. They could do other things, but they won't. But some -- perhaps many -- of Paterson's teachers will move on. Some will move out to suburban districts, where the working conditions are better. Some will leave the profession; many would have been talented teachers, but they also want decent middle-class lives for themselves and their families. They will give up teaching not because they don't love the job, but because they love their own families more. When those teachers go, what then? An endless cycle of young, inexperienced teachers, staying a few years then moving on the moment anything better pops up? Is that what Paterson's kids need? What they deserve? You can't keep degrading pay and work conditions and expect the best teachers to stay in the profession. If you truly believe teachers are important, you need to show them that by paying them professional salaries and giving them professional working conditions -- particularly in the toughest teaching assignments. New Jersey hasn't learned this basic rule of economics yet: whether this contract is voted up or down, it's clearly far less than Paterson's teachers deserve. Once again, it will be the students who pay the price for this neglect. ADDING: Just rereading the contract. Two steps up for a "highly effective" rating? Given the way Operation Hindenburg has structured teacher evaluations, that sounds like a compensation scheme that would be very easy to game. Why Is Bill Gates Making $#!+ Up? One Newark is a Bad Plan. REALLY Bad.